Lawson recalls much about the life of the Railway at Edwinstowe; regular passenger and power station coal trains, as well as, how it gradually declined over the years. 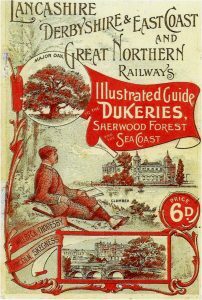 The grandly-titled, ‘Lancaster, Derbyshire & East Coast Railway’, was built and advertised as, ‘The Dukeries Route’. The first train ran between Edwinstowe and Lincoln on 15th December 1896, the station being decorated with bunting for the occasion. Mr. Naish, proprietor of the Royal Oak, the Vicar of Edwinstowe and Harry Wilmot, General Manager of the railway, were among many guests who enjoyed a splendid luncheon at the Spread Eagle in Lincoln before returning home. 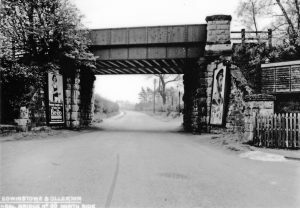 However, the main interest in the railway was to bring people into the village, forest and the Dukeries Estates. 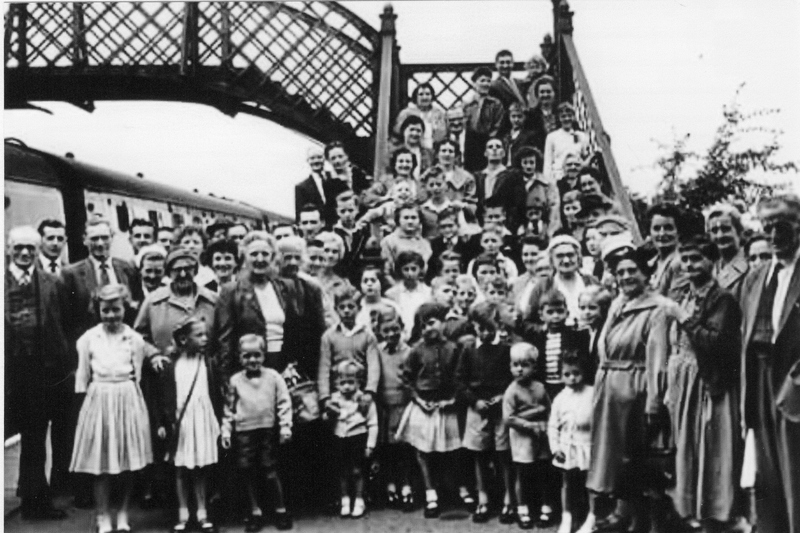 34,000 people visited in the first Summer of operation. 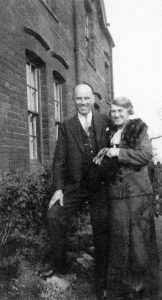 Mansfield Brewery, then decided to build the Dukeries Hotel. It provided accommodation, assembly dancing and had plans for a 1,000-seat restaurant, which was later abandoned. Instead, in 1897 Luncheon for 2,000 people was provided in marquees alongside the station. The Railway station itself was a commodious affair, the third largest on the whole line, with four platforms and a large main building containing, apart from the usual offices, a Refreshment Room; although latterly discussed, it retained its distinctive stained-glass windows into the post-war period. The first stationmaster was a Mr. Ralph. He left in 1899 and was replaced by a Mr. Peachey from Doddington & Harby. At that time, eight people were employed (plus a signalman), this was a large number for a modest station. During WW11, the only fireplace in use was in the porters room which also had a small paraffin lamp. The full article is available in the archives it is an Acorn magazine. Edna Molesworth, née Gardner, a former resident of Edwinstowe, recalls her early experiences in an LMS Railway signal-box from 1944. She had to learn the rules and regulations relating to all railway staff, to understand the meaning of all the bell signals and indicators in a signal-box. She found herself, a shy young lady of 21, the focus of attention, for she was the only female worker in what was previously a man’s world. She was soon confronted with an emergency when, on her section of railway line, an engine broke down She found that a particularly snobbish Foreman Shunter was determined to make her life difficult, but she politely adhered to the rules and her conduct was supported by the Head Controller, who severely reprimanded the foreman. Edna had no problem keeping fit: every day she had a two-mile walk, along a railway track, to and from work. On nights of sharp frost, the signals would be jammed – a dangerous situation. However, she had a solution: she would leave a heavy piece of wood near each signal which she could use to whack the lever at the foot of the signal to loosen it and thereby make the signal operable. Sunday was an easy day, so major repairs were carried out to the track. Able to relax, she often made tea for her workmates. She was trained to deal with emergencies and this she did successfully. She reacted immediately to prevent a disaster when a careless colleague in a neighbouring box had allowed a train to proceed when he should have halted it. When she was obliged to work past her normal hours, her mum, understanding and supportive, would send Edna’s younger brother with sandwiches and cake. Like his famous ancestor, Richard, William Arkwright was a man of vision. He proposed a railway line in 1887 to get his coal to a port from his Sutton Scarsdale estate which stands on a ridge close to Hardwick Hall. The route he planned from Chesterfield to Lincoln was exactly that taken by the LD & ECR ten years later. 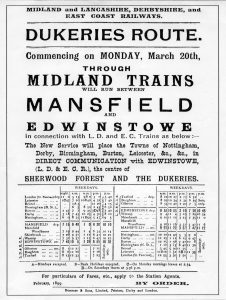 With the expansion of the Nottinghamshire and Derbyshire Coalfield, eastwards into the Dukeries and Sherwood Forest area after 1880, it was felt a new line could help to break the Midland Railway’s near monopoly of local colliery traffic. Increased coal traffic from numerous planned collieries would benefit greatly from the opening up of western and eastern markets. The Manchester, Sheffield & Lincolnshire Railway (MSLR) sought to extend southwards to London, while the Great Northern Railway wanted to go northwards through the Leen Valley competing for lucrative coal traffic. The entire route had been surveyed by 1890. The scheme for the Lancashire Derbyshire and East Coast Railway received Royal Assent on 5th August 1891. The proposal was to build a main line for the transport of coal across England. Westwards it would run from Chesterfield and the rapidly expanding Nottinghamshire & Derbyshire Coalfield via Buxton and Knutsford to a deepwater dock at Warrington on the Manchester Ship Canal. Eastwards it would have taken coal via Ollerton, Tuxford and Lincoln to a new deepwater port at Sutton-on-Sea. There was substantial support from the local coal owners, landowners and miners’ organisations, anticipating upwards of 10 million tons of coal would be carried annually. 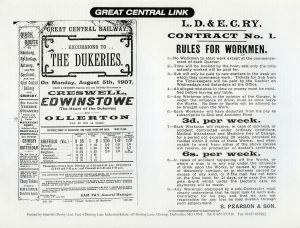 The LD & ECR was the largest railway proposal ever approved by Parliament in a single session, the last of the ambitious Victorian railway schemes. It was disparagingly described by Sir Edward Watkin, the railway entrepreneur: ‘as mad a scheme as ever came before Parliament!’ Amidst scenes of great celebration the first sod for the LD & ECR was cut in Maynard’s Meadow, Chesterfield on 7th June 1892. A special train brought invited guests from St Pancras via the Midland Railway. The LD & ECR Scheme would have created a 131 mile long main line together with branches, just over 40 miles in length, divided into 4 sections for construction purposes. Only the 38 mile long Section 3 from Chesterfield to Pyewipe Junction through Nottinghamshire & Derbyshire coalfield to Tuxford was completed. Ongoing LD & ECR difficulties necessitated GER financial support in 1894. The construction of the 2,624 yd (2400m) long Bolsover Tunnel proved the most difficult, expensive engineering feature –water ingress problems delayed the opening of the line. Further major costs were the 700 ft (215m) long Chesterfield Viaduct, Langwith Cutting and the impressive Fledborough Viaduct with 59 brick arches and four girder spans to cross the River Trent. The double track LD & ECR opened for coal and steel traffic on 16th November 1896. 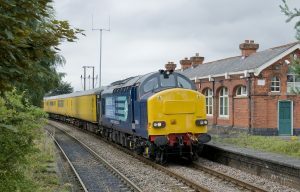 The first passenger trains ran between Edwinstowe, Tuxford and Lincoln on the 15th December, establishing the daily service pattern of three trains each way. Within a month of opening the GER were exercising their running powers over the line to tap into the vitally important coal traffic. 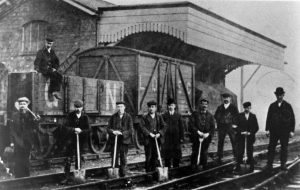 The Headmaster of Edwinstowe School complained in the Log Book about problems caused by a sudden influx of children of navvies building the station and laying the railway track. Arthur Pindar was reprimanded for truanting – he was fascinated by the navvies’ heavy machinery. Miss Edith Watkin, 16 year old daughter of the proprietor of the Jug and Glass walked home from Ollerton so that she could keep her ticket as a souvenir when she travelled on the opening day. Amongst the 120 passengers on the first train were farmers travelling to Lincoln Christmas fat stock market. Along with Lord and Lady Hawkesbury, in 1st class compartments specially reserved by Alfred Naish of the Royal Oak were Reverend Hayman, Vicar of Edwinstowe and Mr H Willmott, General Manager of the line. The gentlemen had luncheon at the Spread Eagle Hotel in Lincoln. One of only three on the line, Edwinstowe station refreshment room was let to Mansfield Brewery Co. Horses and vans from Pickfords & Co performed cartage services at 2s 6d (12½p) per ton collected and delivered, 1s 6d (7½p) per ton station to station and ½d for each parcel. 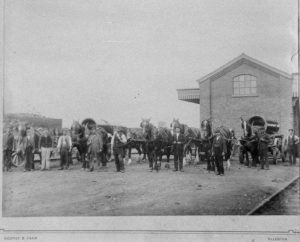 The station had facilities for livestock from Mansfield Cattle Market to be collected and driven home by local farmers and was a busy parcels depot. In 1897, telegrams could be received at the Station, but the Company did not deliver them. One of the larger stations on the line, Edwinstowe had four platforms. There was a 3 ton hand-operated crane for the Goods Yard. The station name was in white lettering on a blue background. 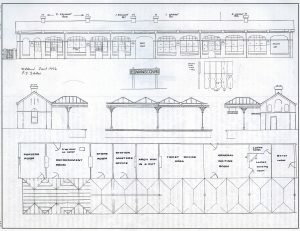 The signalbox was situated at the Chesterfield end of the station between the Up-line and the short cattle dock spur. In the first season the line attracted 34,000 passengers. Some brought their bicycles in the summer months so that they could visit the Major Oak and explore Sherwood Forest. Others were driven through the grounds of local Ducal houses on four-in-hand coaches so over-laden that the Duke of Portland, a member of Edwinstowe Carriage Owners Association, threatened to close the drives at Welbeck Abbey. Mansfield Brewery built their Dukeries Hotel opposite the Station, but plans for a 1,000-seat restaurant were abandoned. At Easter Bank Holiday 1897, Mr. Bird, a Sheffield caterer, served luncheons for 2,000 people in marquees beside the Station. At the same time, in July cheap weekend tickets were encouraging families to visit East coast resorts from Whitby to Yarmouth. A year later, choirs from Edwinstowe and Clipstone departed at 7:15 for their annual summer outing reaching Skegness around 10 am. The LD&ECR had suffered from financial difficulties since it opened. 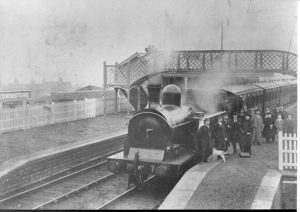 In 1905 talks with the Great Northern Railway (GNR) failed and on New Year’s Day 1907, the LD&ECR was taken over by the Great Central Railway (GCR). Passenger figures had proved disappointing, but mineral traffic had greatly increased. Throughout its 10 year existence, coal traffic was the most important element in LD&ECR business. Between 1914-1918, recruits arriving for training marched the 2 miles to Clipstone Army Camp sometimes accompanied by a band. After the 1923 Grouping, Edwinstowe Station came under LNER management. Edwinstowe Station Goods Yard n.d. The first occupant of the Stationmaster’s House was Mr. Ralph with a relatively large staff of 8. When he was promoted to a new post in 1899, the newspapers praised him for being ‘courteous and obliging’. For the next two years the Stationmaster was Charles E. Peachey. 1901 Census: the three Railway Cottages on Mill Lane were occupied by Stationmaster Llewellyn Davies and family including his 14 year old son Thomas, a Railway Clerk; Signalmen Harry Young and Richard Beech and their families. 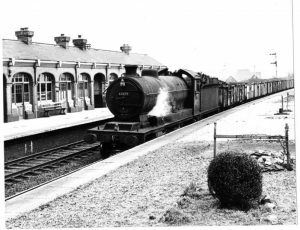 The last Edwinstowe to Nottingham Victoria passenger train ran on December 31st 1955 and the station officially closed to regular passenger traffic on 2nd January 1956. 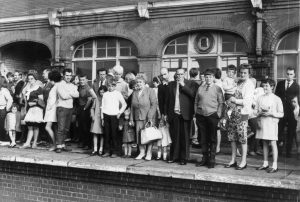 Apart from Goods and Coal traffic, the station only saw Saturday summer specials until final closure on 7th September 1964. The empty building was vandalised until it was bought in 1976 by Howard Wright whose Rufford Construction Company staff spent the winter months renovating the buildings. 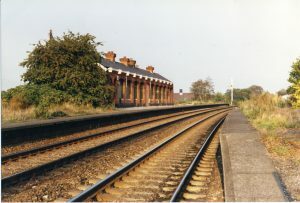 The replacement roof tiles provided by British Railway came from the long-demolished Tuxford Station. Doors and windows were restored. 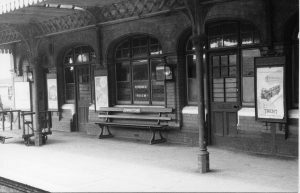 When the Acorn team visited in August 1996 to celebrate the centenary of the coming of the railway, they found the original internal glazed bricks tongue and groove ceilings and clad walls in place, but the glass platform canopy, footbridge and seats had gone. Occupants of the Goods Yard have included canal boat builders; Neville Hutchings grass treatments and a private ambulance firm. 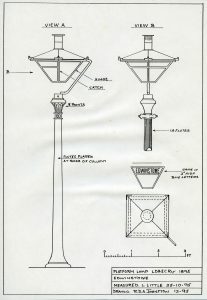 Some of the distinctive Edwinstowe station lamps have found a home at Sherwood Forest narrow gauge railway. The station building provides office and community space. The former Station Cafe on Rufford Road is now a Chinese take-away. 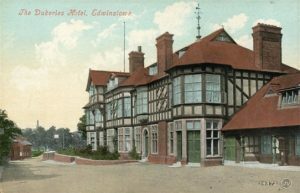 Our thanks to Peter Annable, Barrie Ashton, Chris Booth, Phil Shaw, Robin Stewart-Smith and Margaret Woodhead (Edwinstowe 1890-1900’s, Edwinstowe Historical Society).